As teachers, we have a tendency to devote all our energy to planning lessons, meeting with students, grading, etc. and not take time for our own professional growth. For example, I teach French and I often feel like my language skills are slipping. I can no longer keep up the pace of a conversation the way I used to, and I just can't find the time to maintain the level I would like to have. Yet if I want my students to devote time to improving their language skills outside the classroom, I need to work on my own as well. The broader my vocabulary, the more likely I am to expose them to idiomatic expressions and advanced structures. One way that I can work on my own skills and still encourage my students is through field trips. Every year, we offer students an opportunity to leave English (and technology) behind for a weekend and immerse themselves in French with Aventure Française. Students spend the weekend participating in trust walks, nature hikes, broom ball, tug-of-war, singing and skits... all while remaining in the target language! It is truly marvelous to observe. While it is always rewarding to see the progress that students make and the confidence they gain in such a short period of time, I also have a selfish reason for going. This weekend forces me to speak French as well. Even better, it gives me the opportunity to not be the expert in the room. I interact all weekend with my peers and I regain some of my fluency of expression. I return to the classroom energized and armed with new ideas. The same can be said about honing our teaching skills. It is important to take time out to develop ourselves professionally. This may mean doing pull-out days with our PLC, participating in workshops, or attending conferences. While these experiences frequently mean extra work in the form of planning and sub plans, the payoff is worth it. For more reflection on the benefits of attending professional conferences, see this blog post by Kim Miklusak. 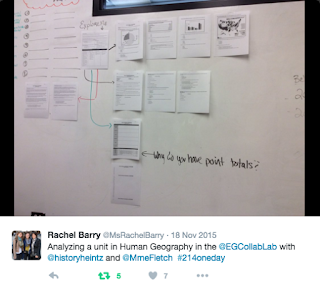 On a smaller scale, the Collab Lab at EGHS offers a variety of professional learning opportunities. Without having to get a sub or take time out for conferences, teachers can join our Teaming on Tuesdays workshops for one period (or even part of a period) to learn through observation and discussion with colleagues and students. 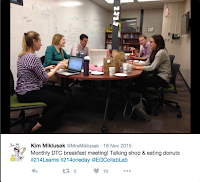 Many teachers also just stop in to chat, get feedback, or exchange ideas. In fact, stop by the Collab Lab during any period on a normal day and you can hear teachers challenging one another and having professional discussions about how our goals align to our assessments or how to best reach struggling students. I sometimes walk out overwhelmed, but more often I leave with new ideas that energize me and encourage me to improve my instruction. I acknowledge that it is hard to take time away from my ever-growing to-do list to engage in meaningful conversation about pedagogy - especially when I really just need to get things graded. However, I truly believe that devoting this time to improving myself and my instruction will benefit my students in the end.